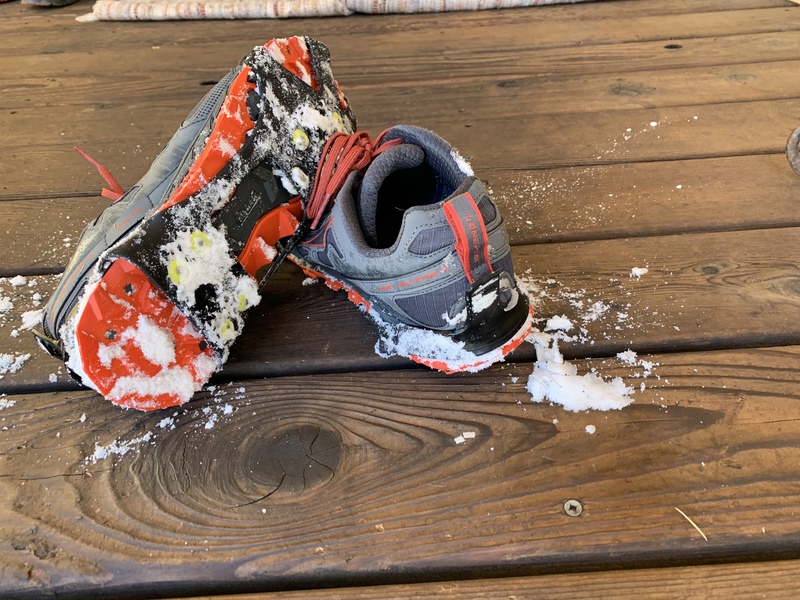 1-1-2019 Running and ice, not a good mix. Happy New Year, New Years eve is much different when you have a 2 year old, an early night is inevitable. It is great to wake up New Year’s Day feeling great, I can remember many New Years nursing a hangover and don’t miss those days. As I look out the window I can see see snow, and my thoughts go to how to encourage myself to get out the door, this time of the year can always be challenging to lace up the shoes and get out the door. Crampons to fit on bottom of shoes or screws, a lot of local running shops will help you put screws in your shoes, for sure do this with an older pair of shoes. Shoes with traction, trail shoes are good for this and look for good traction. A clear mind, you have to be very focused on the surroundings and look for areas that are slick, if in doubt walk in areas that may look like ice. Find areas that has exposed sun and that usually is the best course to run that ice has melted. Grass is always the best and hard to slip and get hurt on grass. This is a for sure spot to walk don’t risk it, I risked it and ended up bruising a tailbone. You approach this it’s like being on a ice skating rink. These are crampons I use and have saved me but they are not 100 percent safe, even with these on it’s slick. Big takeaway is when in doubt walk, don’t risk it because you could be laid up if you go down. Spot on.. always better to be safe than sorry. As we both know, a bad fall can take you out of running for days, maybe more.